By landing where it did, this butterfly called my attention to the subject of noxious weeds. For a “noxious weed” is what, 14 years ago, the Oregon Department of Agriculture declared this flowering bush to be. 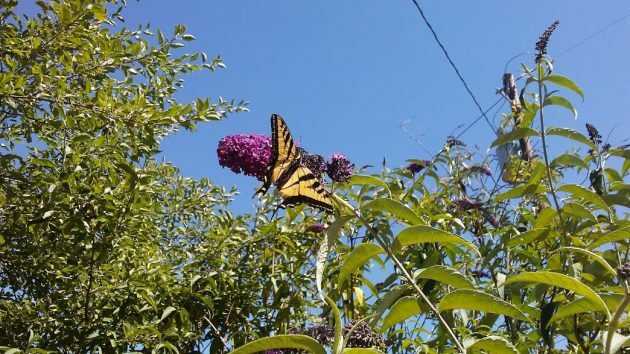 We are looking at a butterfly bush, or Buddleia davidii, in a West Albany yard. The Ag Department listed the species as a noxious weed in 2004 and reiterated its assessment in 2016. “Required …, must …”? Do people know this? If they know it, have they actually done so? Buddleia davidii is said to be native to China and Japan. Because its flowers look nice and attract butterflies, people like it, and the plant has spread in Europe and on the American coasts, among other places around the world. It readily establishes itself in disturbed soil such as along roadsides and riverbeds. 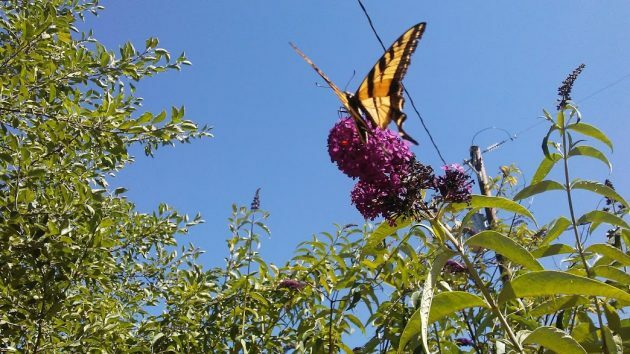 As far as gardens are concerned, the problem seems to be that while the flowers provide ample nectar, the plants tend to displace other types of vegetation that butterfly larvae need for nourishment. And when the larvae disappear, certain bird species vanish too. The state has approved the sale of a number of sterile Buddleia cultivars. But the one in the photo, planted long before the 2004 listing, looks like the online photos of the invasive kind. The nectar is what had this fluttering customer coming back. Douglas spirea is an excellent, beautiful native alternative to this invasive that I cannot reccomend enough. It’s a hardy plant that produces similarly attractive flowers, which butterflies and other native pollinators also love. It can also be an important larval host to some butterflies and moths. Spirea can even be planted as a natural hedgerow. Peter Kenagy has done this to great effect on his farm in North Albany. Yes. And pruning the plant at ground level won’t hurt it at all. In fact, if gardeners cut it down in late winter, it will make the deadheading chore much easier. I find the Scotch Broom which is taking over Oregon to be much more invasive and I’m sure it sends a lot of people into sneezing fits! I’d love to see it destroyed. Perhaps we could build a beautiful wall around Albany. Then, any of the invasive fauna found inside the wall would be hunted down and thoroughly doused with DEET, thereby denying dignity to the Buddleia davidii.